Are you tired of battling with the built-in, old-fashioned VBA debugger? Add an extra layer of professionalism to your applications by investing in vbWatchdog. Designed to make your code simpler, more robust, and easier to maintain. 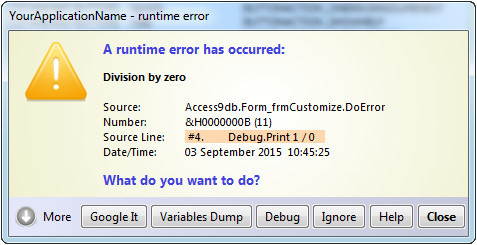 vbWatchdog provides complete global control over error handling inside VBA and VB6 projects. Even robust software can have errors... it's how you deal with them that matters. There are no extra files to distribute to your end-users as vbWatchdog installs itself directly into your project files (within class modules inside your projects). The product is licenced on a per-developer or per-site basis. Licence cost is USD $150 for a single developer. Price includes royalty free end-user rights. vbWatchdog supports VBA6 / VBA7 projects (that means Office versions from v2000 to v2016), and VB6 projects. This product is available in two distinct versions. The Enterprise Edition is designed for use in Microsoft Office VBA documents and applications. The Ultimate Edition can be used in any VBA enabled application (not just Office applications), and can additionally be used in any classic VB6 application. Enterprise Edition USD $150 for a single developer licence. Ultimate Edition USD $180 for a single developer licence. Supports VBA6 and VBA7 (that's Office 2000 to the latest Office 2016). Supports both 32 bit and 64 bit editions of Office. Also supports all special editions such as the Access Runtime environment. Supports all versions of Windows. Office for MAC not yet supported. New to version 3: supports classic VB6 projects too (Ultimate Edition licence). vbWatchdog is off the chart. It solves a long standing problem of how to consolidate error handling into one global location and avoid repetitious code within applications. I had the privilege of Beta testing vbWatchdog and consequently I'm quite familiar with its outstanding capabilities and multitude of extremely cool features. In fact, Wayne added some features I suggested, which have seriously amped up my ‘end user experience’. Among other things, I develop/manage over 25 Microsoft Access databases (mdb/accdb) on my current job. 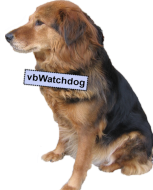 I have integrated vbWatchdog into a single library mdb. Each application mdb is referenced to the library mdb, which connects to a single error log mdb on a server. Virtually any error occurring in any of my apps is automatically written to the error log, all of which is handled by vbWatchdog. This is HUGE! First of all, I have to say that this is an awesome piece of software. I had developed my own Global Error Handler, but this is in a totally different universe. I have implemented it in an Access XP project that will send an error report over an XML Web Service back to our support team, which includes a complete call stack and variable dump. This is an excellent product. I've been using it for 2 or 3 months now and am truly impressed. Once you have got it up and running, it makes coding considerable neater and simpler. vbWatchdog Global Error Handler is the best Tool for Microsoft Access Developers. It helps to build better and secure Microsoft Access Applications. I´d like to recommend the product to all serious Access developers - it helps during development with enhanced information about runtime errors, status of variables etc., but the best thing to me is the ability to catch EVERY error even in your runtime version, but you do not need special error handling in every sub or function - so you´re always on the secure side. And last but not least - the support is very fast and Wayne is really a nice guy!